Fire Magic warming drawer allows plates and cooked food to stay at your desired temperature. The Fire Magic Bar Caddy Warming Accessory allows you to use chafing dish fuel to keep your food warm. 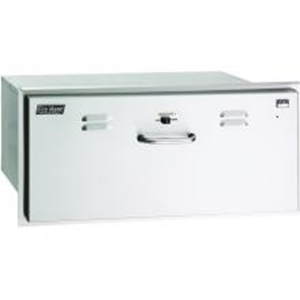 The Fire Magic Below Counter Refrigerator is a must have for your outdoor kitchen area. Conveniently fits underneath your counter top, with 4.4 cubic feet of cold storage for all your needs. The Fire Magic Kegerator is a must have for your outdoor kitchen area. The decorative black cabinet with stainless steel door accents the polished black tower and chrome rail.